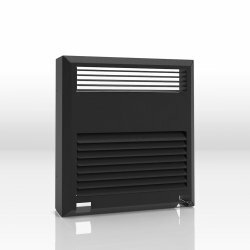 When installing your cooling unit through an exterior wall, you can protect the exhaust side of your unit from the outdoor elements, with WhisperKool's Extreme Exterior Grille. Additional Shipping charges may apply if this item is ordered to be shipped on its own, without the cooling unit. Although the cooling units are rated for various size rooms, the thermal load may require a larger sized cooling unit. Thermal load may be affected by glass in the cellar, room positioning or other factors. Please let a Rosehill Wine Cellar rep make some suggestions for you if needed. January 2018 - FADE TO BLACK - Please note, all WhisperKool units will be changing over to a BLACK shell, as opposed to the current bronze. The changeover is being phased in over next several months, we cannot guaranty which colour cooling unit you will get, but feel free to inquire at time of purchase. Extreme Series wine cellar cooling units from WhisperKOOL ™ are able to withstand temperatures from 32°F to 100°F. 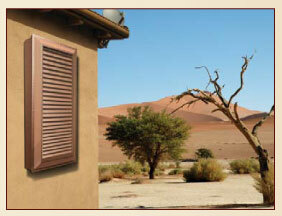 WhisperKOOL Extreme Series can either be wall mounted directly to the outside or can be installed as a ducted system. If Ducting is chosen the a Remote Thermostat Panel is required and must be purchased at the same time as the cooling unit. Remote Thermostat Panels are not sold individually. Remote Thermostat Panel is required when cooling side is being ducted. in high ambient temperature conditions. in ambient temperatures down to the freezing point. The powerful & professional grade fan of the Extreme system ensures wine temperature is consistent throughout the cellar with minimal noise created.Engineered with over-sized condenser and evaporator coils, a powerful ventilation system and a protective exterior housing. Where the temperature is Extreme like very hot or very cold. Where restricted areas have limited space for venting . The ventilation system is ideal for ducting and comes in standard ducting sizes. This allows the installer to easily vent air to and from the unit for optimum performance (please see specifications for details). The Extreme 8000ti can be modified, by the customer, to run the fans at high speed, medium speed, and low speed. The fan speed needed will depend greatly on the exhaust environment. When exhausting outside, it is suggested that you have the unit on the high setting. When exhausting into a conditioned and well ventilated room, go ahead and cut back on the noise using the low fan speed setting. It's as easy as the flip of a switch. There are several ducting configurations that can be applied, however, you don't need to use ducting, you can mount unit directly in the wall without ducting. If ducting to the outside then please request the Exterior Grill option. Note: Do not exceed a total of 25’ for each length of ductwork run and a total of 50’ combined for both the supply and return lengths. When ducting the Extreme series the KDT controller allows for wall mount or flush mount installs. WhisperKOOL wine cellar cooling systems achieve the optimum conditions for a wine cellar by cooling the cellar slowly. As the temperature in the cellar begins to drop, the relative humidity will rise, creating the ideal environment for aging wine. WhisperKOOL wine cellar cooling systems incorporate an efficient environmental stabilization system in a compact, easy-to-install, self-contained unit. The Extreme has two sizes one designed for cellars up to 1250 cubic feet and the other for up to 2000 cubic feet. WhisperKOOL Extreme wine cellar cooling systems have been purposely engineered with the goal to slide in between standard residential wall stud spacing. This requires a minimum of modification to existing wall structures, and is very easy to place the unit where you want it during new construction of a cellar. The Extreme units have a rear flange to directly mount the cooling unit in the wall. The flange allows the unit to be mounted directly in the wall and eliminate the need to build a support shelf. For the Extreme Platinum series, a 24V option is also available which allows you to tie into your home electronic thermostat or home automation system, please inquire. WhisperKOOL designed their wine cellar cooling systems to collect and dissipate any excessive condensation which may accumulate during the cooling process. First a heating element can burn off the collected condensate and evaporates it through exhaust ports on the rear of the unit. Secondly, all WhisperKOOL's units come with a drain line necessary for the removal of any additional condensate. This drain line is an essential back up system for the Condensate Evaporator, and is strongly recommended. If the unit is installed in a high humidity area, WhisperKOOL suggest that its employment is mandatory. During normal operations of the Extreme cooling the wine cellar, heat is exhausted into the adjacent room. This heat must dissipate away from the cooling unit in order for the unit to continue to function properly. 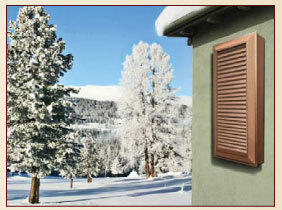 The exhaust must not vent into a closet or a room too small to ventilate the heat. Proper ventilation on the exhaust side of the WhisperKOOL system cannot be overstated. Ducting Systems are available for the Extreme Units. 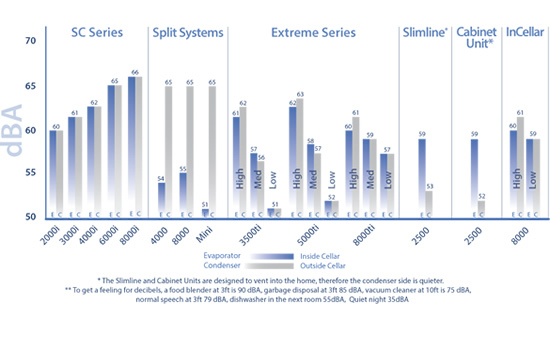 may require an Extreme Cooling unit and if you are unable to use a wall mounted system please look at the Split System. Both of these series are designed for up to 55 degree temperature differential. Like most wine cellar cooling units, these units are designed to be positioned high on the wall in the wine cellar. Think warm air rises; cold air falls. Selecting the proper size WhisperKOOL wine cellar cooling unit is based on the overall cubic foot size of the cellar. This is determined by multiplying the length X width X height of the room. However, there may be circumstances in which a cellar design may require a larger unit due to some design limitations. In such cases we recommend purchasing the next size larger unit to compensate for these limitation. Selecting a larger unit to compensate for a poor insulation will be ineffective.Our staff can help you in making the correct decision. In a properly constructed wine cellar, the WhisperKOOL wine cellar cooling system is designed to cool your wine collection between 50°F to 70°F. WhisperKOOL XLT and Extreme wine cellar cooling systems have been purposely engineered with the goal to slide in between standard residential wall stud spacing. This requires a minimum of modification to existing wall structures, and is very easy to place the unit where you want it during new construction of a cellar. Ducting Systems are available for the Extreme Units & Exhaust Ducting is available on the XLT Units. Additional Shipping charges may be charged for accessory items ordered on their own without the cooling unit. WhisperKOOL wine cellar cooling units are American made units produced in Stockton, CA, California, United States, 95205, USA. They are available for full delivery throughout the USA and Canada. Shipped directly from the manufacturer so you get the most up to date technology available. Please note, California State Proposition 65 - units contain trace amounts of titanium dioxide, which is known to the state of California to cause cancer.